While it’s not exactly the first TiVo Premiere accessory on the market (that’d be the USB modem or any keyboard), TiVo’s 802.11n wireless adapter is now shipping. Order it online today from TiVo.com and Amazon for $90, or pick it up in person from Best Buy later this week. It should maximize, or at least enhance, the Premiere’s speed boost for those who aren’t hardwired, although $90 isn’t an amazing deal. But it does come in less than the possibly overpriced Xbox 360 802.11n adapter (MSRP $100) that Microsoft offers gamers. The prototype I saw in Vegas at CES looked like a jumbo version of the orignal TiVo wireless adapter ($45-$60), which isn’t going anywhere. 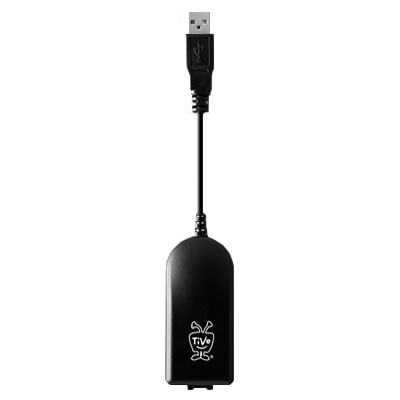 However, instead of a single USB cable that channels both data and power, the Wireless N adapter utilizes a Y-shaped cable, which forks into a Ethernet run and a power adapter. So, it’s not quite as clean a solution for the clutter-obsessed. Given the adapter’s physical network connectivity, it will work fine with prior TiVo units (and probably non-TiVo gear). Although Series3 and TiVo HD owners are never going to see the sorts of transfer speeds that the Premiere offers. As for me, I have a secondary wireless router (802.11n, AEBS) in the entertainment center which extends my network while providing three Ethernet jacks — one of which the Premiere currently utilizes. The bedroom TiVo (S3) rotates between an original TiVo wireless adapter and a USB-powered ASUS 802.11g wireless bridge, providing significantly faster speeds due to it’s Ethernet connection and related to TiVo’s architecture. On my ASUS Ethernet bridge, referenced above, it’s not too difficult to set it up. However, it’s not plug and play like the 802.11g USB adapter. I hope to have one of the new ones in here shortly and will report on the config software. Ick. Not plug ‘n play? Really? Wow, these guys really don’t know how to build anything anymore now do they? In desperate need of more speed for transferring HD shows between Tivo HD units I’ve already abandoned wireless and have either Ethernet or MoCA bridges at the Tivos now which let me provide multiple Ethernet ports for very little. BTW, the note on the ASUS bridge is interesting. Hadn’t seen that before. I mostly use a Cradlepoint CTR350 which I power via USB, but I had to make the cable myself using the forum provided pinouts. Course it does handle 3G modems too via USB. $90 for a Tivo branded adaptor! Yippee! I love being stupid and being a Tivo customer! I use an airport express (N) to get wireless to my S3 and the transfer performance is still basically useless on HD shows. I’m sure the Premiere is better performance. I can’t see buying this though over an airport express, especially if your tivo is next to your stereo. You get streaming to the stereo from iTunes with the airport express for free, plus a shared USB port.